Miriam Yeung (楊千嬅) is confirmed to star in TVB’s upcoming television drama Wonder Women <多功能老婆>, produced and helmed by critically-acclaimed scriptwriter Ella Chan Po-wah (陳寶華). Wonder Women will be Miriam’s first TVB drama since 2001’s A Taste of Love <美味情緣>, 17 years ago. It is also Ella Chan’s debut as TVB producer, as well as her comeback drama with TVB. Her last TVB drama was The Comeback Clan <翻叮一族>, which aired in 2010. Starring alongside Miriam will be Pakho Chau (周柏豪), Melvin Wong (黃錦燊), Raymond Wong Ho-yin (黃浩然), Alice Chan (陳煒), Tony Hung (洪永城), Rebecca Zhu (朱晨麗), and Andrew Yuen (袁文傑). The Wonder Women project was first announced in the summer of 2017, with the confirmation of Ella Chan’s return to TVB. At the time, Sheren Tang (鄧萃雯) was in talks to play the female lead. Charmaine Sheh (佘詩曼) and Linda Chung (鍾嘉欣) were also considered. Miriam’s casting was not revealed until at the Wonder Women press conference today. Aside from Miriam, rest of the cast is pretty weak. And I find it interesting that Pakho gets top billing with his name listed ahead of Raymond Wong’s in the cast list even though it sounds like Raymond is first lead on this one due to his pairing with the first female lead Miriam (TVB favoritism perhaps or media biased as usual). Since this is actually a reunion of sorts for Miriam and Raymond — the last time they truly collaborated (not counting those RTHK ICAC series) was in the movie Love Undercover back in 2002 – and TVB is clearly using that movie to hype this series (um, can’t be coincidence that the name of Raymond’s character in this new series is “Kim Hung” which is exactly the same name as his character in that movie), it’s only fair to give Raymond lead billing over Pakho (plus Raymond is a “veteran” in terms of acting when compared to Pakho). @llwy12 Didn’t Pakho sign a contract? @tiffany Music wise, yes he is signed to Voice Entertainment but I don’t think he signed management contract with TVB, as I believe he is still under Stephen Shiu Jr’s managment company (at least that was still the case a little while back ago when Louis Cheung got banned by TVB and people were questioning why Pakho didn’t get banned too when he is under same management company). I don’t follow Pakho’s news though so who knows — maybe he ended up signing management with TVB as well? @jimmyszeto Yup! Miriam and Raymond actually had good chemistry in that movie. Unfortunately, it looks like TVB favors Pakho over Raymond. I was watching all the interview segments from various entertainment news reports last night and it’s quite apparent that TVB is really pushing Pakho with this series, even though Raymond appears to be the lead. 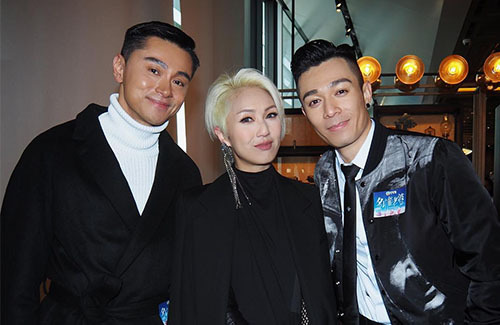 When Pakho was interviewed, he said that he actually knew Miriam was chosen to play the female lead and it was hard having to keep it a secret from everyone….versus Raymond who actually had no clue until the actual press conference when Miriam walked onto the stage. Raymond said that for a few moments prior, when he found out the name of his character in the series, he did suspect perhaps it could be Miriam but he didn’t think that was possible. According to all the news reports, TVB had kept the identity of the female lead for the series under tight wraps and supposedly NO ONE knew except the execs and the production team (scriptwriter/producer/director) – yet, Pakho claims he DID know….so either he is claiming to know when he actually didn’t or TVB is giving him special treatment by letting him in on “privileged” information…if it’s the latter, than that’s a pretty clear indication to me that TVB considers Pakho the first male lead who gets to share in all the “latest and greatest” inside information on the series. And don’t get me started with Tony, lol….apparently, he lobbied really hard to be in this series (at least that’s what was implied based on the interviews) and it’s not surprising that he got in given that he has connections in high places….unfortunately, his acting hasn’t improved one iota so having him in this is definitely not a good idea. The other part of this that no one has been talking about….when I saw Melvin Wong’s name in the cast list, I was a little surprised at first, since he hasn’t filmed anything in a long time (and I didn’t think he would since he seems to be pretty busy in his “real” job), but then I remembered that Chan Po Wah was also one of the scriptwriters responsible for A Kindred Spirit..and then of course I watched Melvin’s interview where he said that Po Wah jeh had called him up (since they’re still close friends from the AKS days) and said she had a character that was a good fit for him and asked him to participate. To be honest, I would actually prefer A Kindred Spirit reunion for this series rather than the cast they have now….but oh well…. Is it just me o, does anyone out there think Pak ho looks like lay cheung? They r so much alike. They r pretty cute boys. Ohhh…I never find Miriam Yeung’s movies or dramas interesting at all so I am not sure the hype w/her but oh well…. @wm2017 My thoughts exactly! Guess there’s nothing interesting to look forward to for the coming dramas. Can anyone tell me where I can watch the old dramas such as the Alex Man-Carol Cheng drama doing its rerun currently? You can try this site…lots of oldie tvb stuff as well as newer dramas from korea/china/taiwan too I think. Take a look!